My favourite role as a research psychologist is recording and analysing the language people use when they are discussing something which I’m studying. 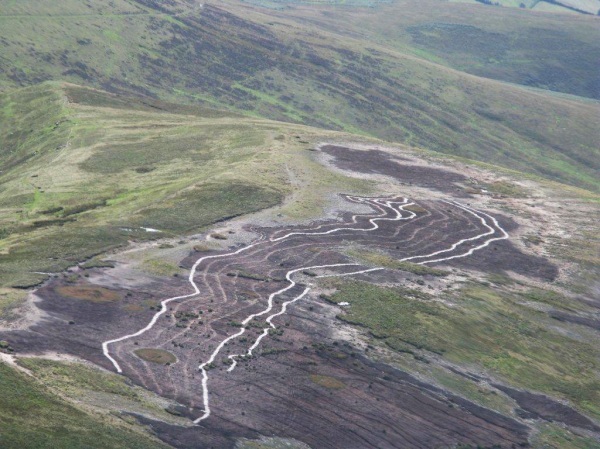 Our friend the artist, Pip Woolf is running a fascinating project attempting to mend a badly eroded peat bog on a local mountain top using local wool and local people. Over time, she is drawing lines of wool which look spectacular and are slowly halting the ongoing erosion. On the last trip up the mountain, I took my digital recorder to try to capture how different volunteers understood or related to the project. Here is the result. I like the fact that some people talked about the ecological and artistic aspects of the project. Others compared it with other much more “high-tech” projects elsewhere. But for others, it was simply enjoying the horses or hammering in the pegs to hold the wool, the stunning scenery or the chance to meet new people. People won’t necessarily engage in sustainability projects for sustainability reasons – they may simply do so because it’s fun or different or sociable. I like it. This entry was posted in Psychology and tagged art, ecology, language, peat bog, pip woolf, woollenline. Bookmark the permalink.